Kovair team is proud to announce the release of version 9.0 for all its products Kovair Omnibus, Kovair DevOps and Kovair ALM Studio. We have also enhanced many of our existing features and fixed bugs to improve the overall experience with Kovair products. This release supports the deployment of Kovair on Windows Server 2008 R2. Release 9.0 applications can be accessed by latest versions of Google Chrome, Firefox 54.0.1, and Internet Explorer 11.0. Kovair 9.0 will now feature a hierarchy-based portfolio structure that will enable users to create multiple relationships between artifacts. This is unlike anything that we had in our previous versions. Until 8.8 edition, Kovair only supported a linear-based portfolio structure. As a result, it was only possible to create a single hierarchical relationship between artifacts. Not anymore! With the introduction of this feature at Portfolio level, users can now arrange all related projects under multiple groups and can also relate the portfolio level artifacts between themselves as per their business need. Kovair ALM will now have a single new interface for viewing and executing Jenkins Pipelines. Viewers can monitor data from pipelines belonging to multiple workspaces. The single window interface will also enable users to execute multiple Jenkins pipelines at multiple workspaces. With the introduction of template-based registration, Kovair aims to reduce the redundancy and the tedious work process of having to enter adapter details every time a tool needs to be registered with Kovair Omnibus. Prior to 9.0, a tool registration could only be done at individual workspace level. Users had to visit each workspace separately to get a tool registered using the adapter URL and specifying the security parameters. Template-based registration — which will now be available from Kovair 9.0 onwards — will enable users to get a tool registered for multiple projects. This will be a one-time process and users will not have to visit each workspace individually to register a tool. Kovair ALM 9.0 version has now introduced attachment support for files stored in cloud. 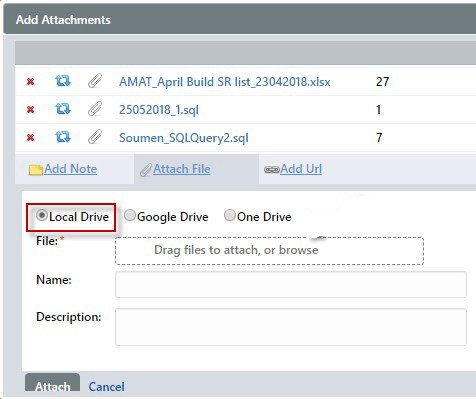 Unlike the Local File attachment that comes by default, users can now upload and attach files via Google Drive and One Drive. The files will be attached in the form of a link by virtue of which anybody who views those attachments will always get the latest edited version of the attachment. Record management has become much easier now with Kovair ALM 9.0. Along with viewing records in a list like format, users can now create a hierarchical folder structure for grouping different records and arranging it in an organized format. With the introduction of this new feature, Kovair aims to make data management and tracking more advanced as well as user-specific, i.e., give permission to specific users only. Users can now capture screenshots of any defect that arises and submit it as a supporting proof to bring to immediate attention of team members. The new Kovair Screenshot Capture will enable users of 9.0 to capture screenshots, make edits, create records, download a copy of the screenshot and use it as a Description for an ALM item. The feature is supported in active Chrome tabs. Users will be able to capture the screenshot and raise the defect or create any other ALM artifact from the same screen without having the need to login to Kovair application interface separately. Sync Monitor is an on-screen graphical interface for real-time monitoring of data exchange. Users can now track events and actions captured in real time as well as detect transactional errors if any. In addition, users can easily filter the details in synchronization monitor according to their needs. While the latest enhancements in Omnibus Sync Monitor enables users to view historical data using pagination, change number of records shown per page, and more; Kovair ALM 9.0 has some new additions. Version 9.0 will have a more advanced filter option and an alternative Grid View layout option. Until 8.8 edition, the Notification Bell was default feature in Kovair ALM. Users of 9.0 version can now choose to enable or disable the Notification Bell functionality from their instance. This is an enhancement introduced in Kovair ALM in this version. 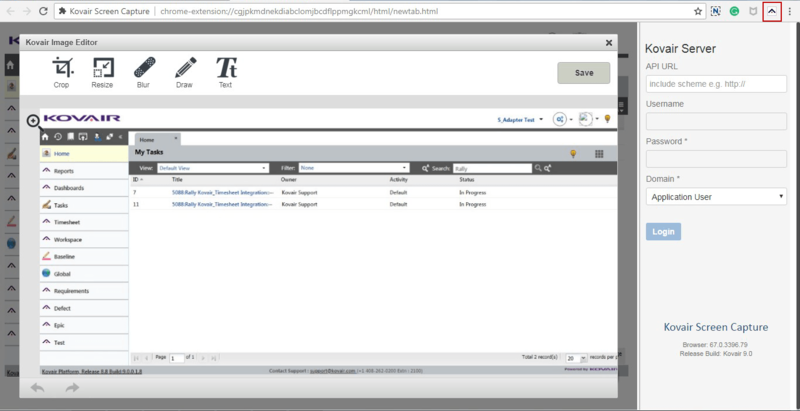 Users can now create reports using the entities and fields created at PPM layer. As a result, users can now monitor and track data from predefined reports at the Portfolio level. Kovair support for API was already available to our customers from 8.8 edition. In 9.0 edition, users will also find API support for endpoint exposure at PPM level. Kovair being an enterprise ALM application, the said feature is a must for all large organizations where user access to tools are driven by AD groups. Users can control Application access against AD groups. The latest enhancement in the 9.0 edition eliminates the need of regular site maintenance activities and the need of manual imports every time a new user joins in. Analytical tool integration is a new implementation made in Kovair DataLake product. The purpose of this new implementation is that it allows end users of Kovair DataLake portal to view EazyBI (BI Reporting tools) reports within DataLake portal. To avail the EazyBI reports, one needs to connect it with Kovair DataLake first. For this, the user must have a valid running EazyBI tool URL having enough license. Kovair Windchill adapter helps to achieve an ALM-PLM integration scenario by establishing integration with a PLM tool like PTC Windchill. With other integrations from Kovair, organizations can connect PTC Windchill with 75 other ALM, PPM or ITSM tools. It exposes entities of Windchill tool namely Product, Change Request, Change Notice, Change Task, Issue, Variance and along with it supports the flow of attachment and comment. Kovair Ansible adapter is designed to support normal event service based data sync for deployment and configuration. Launching a Job Template and relaunching a Job Template. Running a Job Template and Relaunching a Job Template. Kovair helps to achieve integration with ITSM tools like Service Now through the Service Now adapter. It is primarily intended for customers where the servers are hardened. Kovair ALM provides support for four primary entities— Knowledge Base, Change Request, Problem, and Incident. In 9.0, the adapter has received certification from Service Now. Jenkins Extractor is another new implementation that has been made in Kovair Data Lake. The main purpose of this implementation is to enable users to extract event-based data from the tool and store it directly in to the database without doing any kind of data modification. Data is stored in its original format thereby enabling users to monitor data and create reports. The entities for which Jenkins Extractor can extract the data are Job, Build, Pipeline View, and Pipeline Execution. The latest adapter of IBM Rhapsody 8.3 helps to achieve integration with a design management tool like IBM Rhapsody. The adapter helps the user to fetch design related artifacts such as Elements [Use Case and Actor], Diagrams, Requirements, and Projects along with Relations. In release 9.0, the adapter has been upgraded to make it compatible with the latest tool version. The latest version of HP ALM adapter for the above-mentioned versions is designed to manage the various phases of a Software Development Life Cycle (SDLC) right from the requirements gathering to testing. An all-in-all ALM suite with all the core ALM capabilities. In release 9.0, the adapter has been upgraded to make it compatible with the latest tool version. Kovair ALM 9.0 will now feature a placeholder along with a browse button for attaching files. The benefit of this new feature update is that users can easily drag and drop a file straight from a folder instead of having to browse first and then click on it to attach it. This new enhancement will reduce complexity especially if there are numerous files in the folder through which you will have to search. Maximize support is the latest addition made to the rich text field in Kovair ALM. The latest enhancement aims to improve the user interface and user experience of Kovair ALM users. The Comment and Attachment fields in Kovair ALM 9.0 have been made easily accessible. Users can now click into a Comment or an Attachment field to quickly identify which of the record items have a comment or an attachment added to it.